Last week’s mini collar was a complete success, and a very welcome one as well. A spot of illness totally ruined my timetable, so it was fortunate that this collar turned out just right, and I was already finished stitching it before things got derailed. With a new week beginning, I can use the start of a new collar to help me get back on track. The design process for this collar was a lot more difficult than it would seem from the simplicity of the piece. I wanted to use an as-yet uncut strand of glass drops, but I also didn’t want to use all of them up in a single necklace. At the same time, I wanted to make sure that their presence in the piece would be worthwhile, so it was important to use them well. It was also important not to repeat the focal design that I’d used for the previous two collars, so it took some time to decide exactly how to balance out the drops. Although there isn’t a lot of complicated pattern work in this collar, it showcases the drops very well, and has just enough color to be interesting. I’m really pleased with how it turned out. I haven’t begun to work on the new collar design just yet. I did want to work on something without drops for a change of pace, so I’ll have to spend some time with my beads and see what happens. Cleaning up my workspace, which has been accumulating bead packets for a while now should prove inspiring! My beading trays look much the same this week as they have for the past month or so. I’m making good progress on this week’s mini collar, using some of the greens I experimented with for a recent bead color challenge. I’m very happy with how this collar is coming along, although it is pretty tame compared to some of the previous projects that held a few surprises. I think for the next piece, I’m going to have to try something a little more exciting. So far I’ve tried to choose accents and build patterns on a whim, just to see what will happen, but I think a little more planning is in order for the next project. I’m also nearly finished with the blue dagger necklace, at last. I have a whole bunch of tutorial projects lined up for my days off, so I’m not entirely sure if I’ll be able to finally finish this necklace before another week begins, but I’m certainly going to try. I have a feeling that it’s going to turn out great. Because the daggers have a curved shape, they don’t drape in a uniform way; I would have preferred a more even look, but in the end I think it will look great anyway. Only a few more hours of work and I’ll know for sure. One of the best things about making your own jewelry is the ability to make it versatile and even interactive. It can be as simple as designing three necklaces to be layered together, or making a variety of focals to pair with a favorite rope stitch. Once you’ve finished making a piece, the real adventure is in how much fun you can have wearing it. 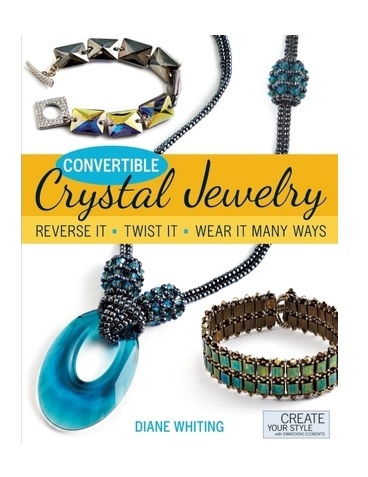 In Convertible Crystal Jewelry, author and Swarovski Elements Ambassador Diane Whiting offers a beautiful selection of adjustable, mix-and-matchable projects for beaders of every skill level. Each one features gorgeous crystals and new ideas on how to make the most out of your beads. There are 25 projects in all, each one using a mix of components and techniques to help you build and test your skills. There are designs for stringing, knotting, wirework, ladder stitch, peyote stitch, and so much more – each one more inspiring than the last. 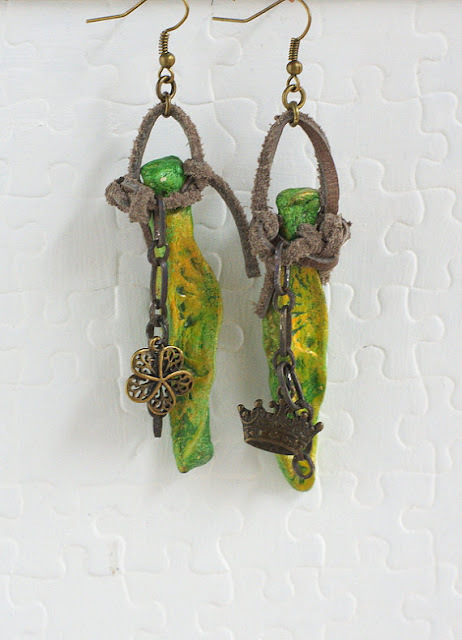 Diane’s projects make great use of the crystals and other components to create beautiful, versatile jewelry. There are beaded focals to wear with your favorite necklace base, necklaces that can become bracelets, tassels that can go anywhere, and two-tone bracelets that you can flip to match your mood. Many of the projects are created with ingenious techniques that spark so much inspiration, such as layering pairs of crystal flatbacks to make two-tone rivolis! After a quick overview of materials, the projects begin, starting with a super easy lark’s head necklace for showcasing your favorite big-hole beads and Swarovski Elements fancy stone pendants. The difficultly increases as you go - the final projects feature more advanced techniques like beaded bezels and tubular right angle weave. Each project includes a materials list and step-by-step instructions with clear photographs to guide you through the design. There are also tips for adding even more variation to your finished piece, including ways to mix and match components from other projects to create something totally new. My favorite design is the Tila for Two x Two reversible cuff that looks gorgeously slinky and fun to weave. If you’re looking for ways to revitalize your jewelry stash, Convertible Crystal Jewelry is sure to provide lots of inspirations. Many of the projects can even be converted to dress up your existing pieces and make them new again. Inspirational Beading has not received compensation for reviewing this title, however, actions you take from this post can result in a commission for Inspirational Beading. This week’s mini collar was a bit of a whim. When I opened my tray of daggers and drop beads to plan the next design in the challenge, I was once again a bit overwhelmed by how many choices I have. Although I have months to work through and try them all, deciding each week where to go next isn’t always that easy. Eventually my gaze fell on the last 5 jet black daggers from a strand that I picked up ages ago, and I thought it would be nice to finally finish them off and remove one entire option from the list. Choosing colors to go with the daggers wasn’t easy either. Whenever possible I want to stick to Egyptian palettes, while also trying out new patterns in the chevron chain. Although I wasn’t sure how well the finishes would mix at first, I finally settled on opaque slate blue and dark cream Ceylon to get a faience and alabaster look. For pattern I went with some simple blocks of color to get a horizontal stripe effect. For next week’s collar I’m going to try out a recent bead color trio, and then perhaps it’s time to go for some smaller accents like my teal magatamas. Now that we’ve covered all of the essential basics of working with peyote stitch, we’re moving on to some of the more exciting variations available for this versatile stitch. We’ve already tried out circular peyote by working skip-a-bead-add-a-bead in the round, so the next logical step is to go 3-D with the marvelously meditative tubular peyote. Basic tubular peyote looks a lot like tubular bead crochet, and can provide some wonderful ropes for necklaces and bracelets. 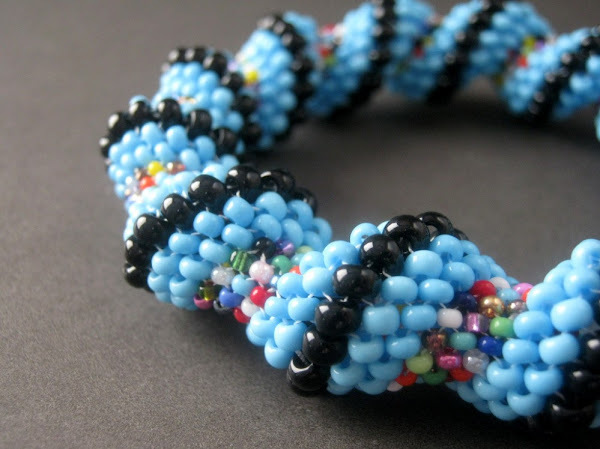 When worked in a single size of seed bead, the structure of tubular peyote stitch falls somewhere between bead crochet and tubular herringbone. It isn’t as supple and as crochet, but it is more flexible than herringbone. One downside is that the larger your tube is – or the more beads you start with – the more prone it is to buckling or collapsing along the tube. This is why many tubular peyote projects are worked over a form such as silk cord or latex tubing. If you’re already familiar with the basics of peyote stitch, tubular peyote should be an easy transition. The key to getting started with this technique is not to worry too much about how your first few rows look. If you start out a little wobbly, you can always remove those stitches and reveal the cleaner beadwork within. Like with circular peyote, I recommend using size 11/o seed beads, and working without a stop-bead to get even tension. In the example piece, I’m using size 8/o seed beads for clarity, but you’ll find that size 11/o beads grip the thread a lot better and make it easier to get the stitch going. You may want to have a dowel, knitting needle, or other form to stitch with. It’s not necessary, but if you find yourself crushing the beadwork while pulling new stitches taught, it can help protect the tube. A mandrel also makes it easy to keep the tail thread out of the way while you work. Once you’ve stitched about an inch of beadwork, it should be safe to continue without a form. 1. On about 1 yard, or one arm’s length of thread, pick up an even number of seed beads. For a beginner rope, 8-12 beads is ideal. 2. Slide the beads down to the end, and stitch through all of them again. Pull snug to form a ring, leaving at least a 6 inch (15 cm) tail. Pass through 2 or more beads to secure the ring. 3. Pick up 1 seed bead. Skipping the next bead in the ring, stitch through the following bead and pull snug. Repeat all the way around the ring. You will add half as many beads as you picked up in step 1. Do not try to force the beads into a tube shape just yet. Keep the tension loose so the first round will look just like a circular peyote start. 4. At the end of the round, you will need to step up. Skip a bead, add a bead, then follow through the first bead picked up in this round and pull snug. 5. Pick up 1 seed bead, and stitch through the following raised bead – the 2nd bead added in the previous round. Repeat for the rest of the round and step up. 6. At the end of the round, you can pull the thread snug to cinch up the beadwork and form the start of the tube. You can slide the ring onto your mandrel or dowel here if desired, making sure that the tail thread is pointing towards you. Turn the beadwork on the form as you work to add each new bead. 7. Continue adding 1 bead at a time, stitching onto the raised beads as usual. The beads will now rest evenly and the tube will continue to build. Step up at the end of each round. Weave in your threads once the beadwork has reached the desired length. Even-count tubular peyote is ideal if you want to include any type of pattern or a spiral design in your rope. If you’re working with a single color or a mixture and aren’t concerned about pattern, you can also work odd-count tubular peyote. The best thing about this variation is that there is no step-up. You simply add 1 bead at a time continuously for as long as you wish. To make an odd-count tube, just string an odd number of beads in step 1, then add one bead at a time with peyote stitch until finished. One easy way to enhance the structural integrity of tubular peyote is to work with at least two bead sizes. This creates a simple spiral and makes the tube much stronger by providing a balance in pressure points. Even if the beadwork does kink, it will be hidden within the spiral. For our practice project, we’ll be working with spiral peyote in 2 bead sizes to make a bangle. This is a great design to make if you want to play with adding patterns to tubular peyote. Though the pattern here is very simple, you’ll be able to see the changes in the beadwork very clearly as the bead sizes reshape the tube. I’ve used size 15/o and 11/o seed beads, but you can also use size 11/o and 8/o. You’ll need at least one color of each size. I’ve used 2 colors (A and B) in the smaller size to help accentuate the spiral even more, and an 11/o mix (color C). 1. On a yard or one arm’s length of thread, pick up 2 color A beads, 4 B, 2 A, and 8 C. Slide all of the beads down to the end and stitch through them to form a ring, leaving about a 6 inch (15 cm) tail. 2. Pass through the 1st 2 A beads again. It is very important to start your beadwork here to establish a continuous pattern. Once the beadwork is complete, the opposite end will match up to the starting rows so that they can be zipped. 3. Pick up 1 color A. Skipping the next color B in the ring, stitch through the following B and pull snug. 4. Pick up 1 color B. Skip 1 B in the ring, and stitch through the following B. 5. Add 1 more B with peyote stitch, followed by 1 A. You will always add the same bead size or color as the one that your thread is exiting. 6. Add 4 C with peyote stitch, and step up through 2 A to finish the round. 7. For the remaining rounds, add 1 A, 2 B, 1 A, and 4 C. Cinch up the beadwork into a tube and place it over a mandrel if desired. Continue weaving until you have a spiral tube that is at least 8 inches long. Do not try to bend or curve the tube before you have reached the desired length. 8. To add new thread when needed, drop the working thread after stepping up. Secure a new thread in the beadwork and exit from the same bead as the previous thread. Park the new thread, then weave in the old thread before continuing as usual. 9. Thread a needle on the tail thread from step 1 and weave it in (or weave it a few rows away from the edge and park it for now if desired). Gently bend the beadwork and bring both ends of the tube together until the pattern matches up. 10. Using the working thread from the fresh end of the tube, stitch through the adjacent up bead at the opposite end to begin zipping up the beadwork. 11. Weave back and forth across the join, zipping the up beads together with peyote stitch. Pull snug after each stitch. Because there are so many different bead sizes and colors at work, it can be easy to lose your place and stitch through the wrong bead. Working carefully, one bead at a time, and always look for a bead that looks less ‘attached’ than those around it. This will be your next up bead. 12. When you reach the end of the round, you should have a seamless join. Check over the area carefully to be sure that the beads were zipped up correctly. It should be impossible to tell where the spiral ends or begins. Once you’ve mastered the basics of tubular peyote, there are some very fun variations to try. One of the lesser-known spins on the peyote tube is the Dutch spiral, which adds a large increase to the rounds that turns into a fringe-like bridge. One of the most popular styles of tubular/spiral peyote is the Cellini spiral. We’ll be practicing this technique in an upcoming Master Class lesson, but if you want to give it a go right away, the classic recipe to start a Cellini spiral is: 6 size 11/o, 4 size 8/o, 2 size 6/o, and 4 size 8/o. Remember to stitch through the first 2 size 11/o beads to begin the first round. This week my bead tray looks like all kinds of progress. I’m about an hour away from completing a new mini collar for the challenge, incorporating the last 5 jet black daggers from a strand that has been serving me for some time now. It will be sad to see them go, but also nice to finally finish off the strand and not have them floating around any longer. I was also able to get a few more fringes in on the tropical necklace. The coconut daggers seem to fit into the design quite nicely. I’m not going to call it a success until both sides are complete and I see how it all looks with a symmetrical drape, but so far things look very promising. Meanwhile, there’s only a little bit more work to go on the new Peyote Stitch Master Class project. There have been a few mishaps along the way and I had to do some of the work over again, but I’m sure that we’ll have this lesson wrapped up on time. Today I’m in the mood for a little jewelry eye-candy, and nothing beats polymer clay when you want to feel a little creative awe. Really great polymer clay designs are like a combination of sculpting and painting, yet they’re so much more than either of those things. There are lots of essential techniques that look amazing when done well, such as canes; there are also many unexpected ways to smoosh that yield amazing results. Like many of the materials that I’ve sworn off for my own designs, I am often envious of polymer clay designers and the things that they can achieve. I stick by my choice, but I can certainly admire the possibilities! So, I did some window shopping without any particular style of polymer clay work in mind, and hand-picked several pieces that are just sure to make you say “Wow”. These are my favorites. Polymer clay was around for years before I even knew about beadwork, though back then everyone just called it by the brand name Fimo. Though interesting, I didn’t really take much notice of it until after I had started beading, and came across some polymer clay appliqué designs that were utterly stunning. 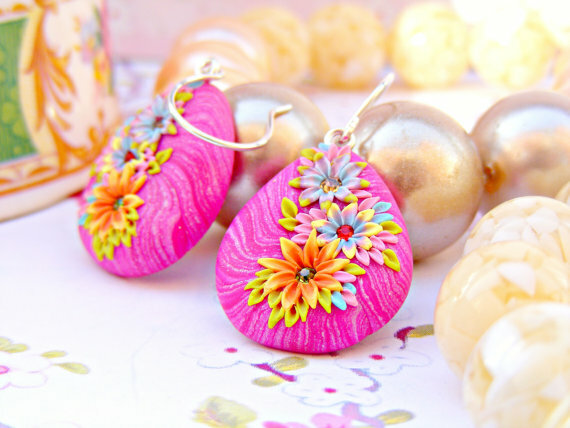 These pink floral earrings by Sweetystuff use the head-turning appliqué technique to perfection. Creating your own color blends and sculpting your own bead shapes is a super power, as seen in this statement bracelet by Adriana Allen. Unlike your basic beadwork, stringing, chainmaille, or metalwork, there are no rules or limits when it comes to smooshing. Oh the wonderful things that canes can do! The technique of using cane slices to make gorgeous motifs has been around for hundreds of years, and is still used in traditional glass studios in Venice. The big advantage that polymer clay canes have over glass is the amazing colors and blending possibilities. You can’t get a gorgeous ombré effect like the one playing across these earrings by Natka Handmade without clay! This is not your grandmother’s millefiori! 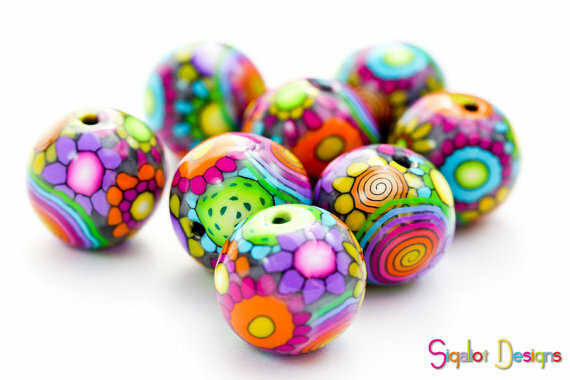 Once again the depth and richness of polymer clay colors outshines traditional cane designs in these beads by Sigaliot. Although I love new and vintage Ventian glass a lot, it doesn’t quite have the same pop when it comes out of the kiln. Unlike other jewelry materials, polymer clay can be transformed into almost anything, be it realistic or whimsical. 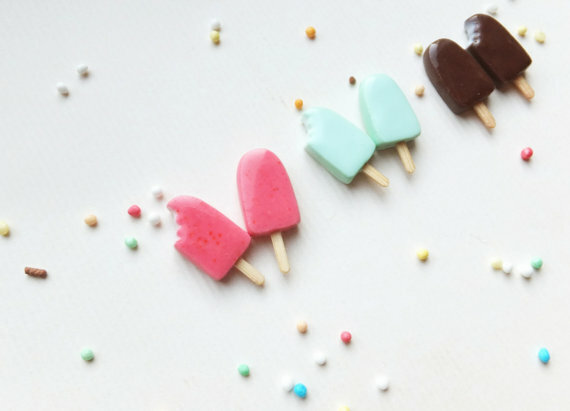 There are some amazing artists out there that create the most edible looking miniature food you’ve ever seen, as well as adorable food themed designs like these popsicle earrings by Dzy Dzy Design. 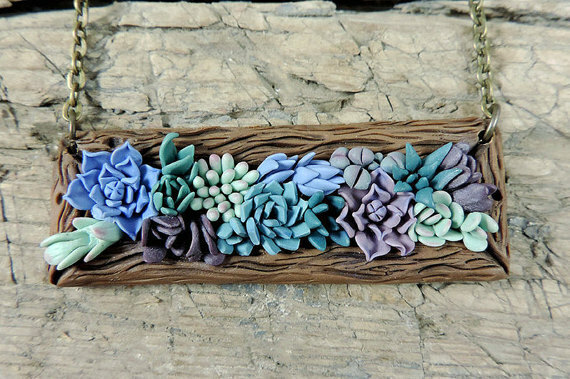 More sculptural possibilities are seen in this succulent pendant by sofoxyclay. The colors and shapes are gorgeous, but what really makes this design special after the first glance is its size. This piece is actually quite tiny at just 5 cm, or 2 inches, wide. One of the best things about polymer clay is that you can use it to create components that perfectly match your aesthetic, and are 100% unique. 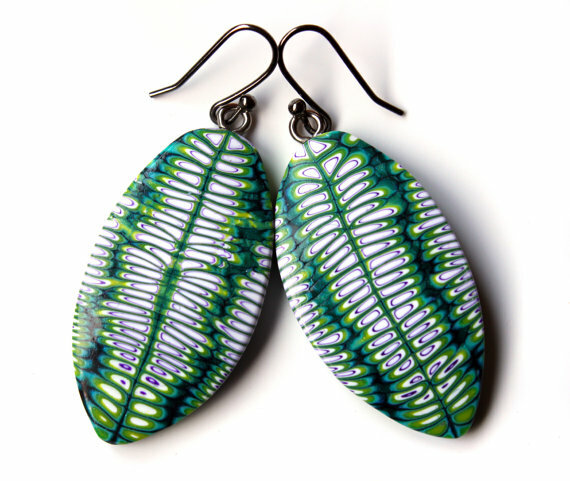 These gorgeous earrings by boele are actually made with wood clay, but have the same one-of-a-kind ‘oooh’ factor that I wanted to find in my search. 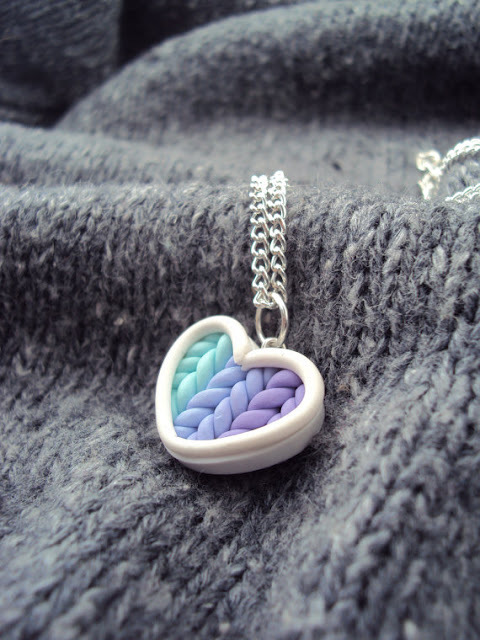 Another great example of polymer clay’s versatility is this adorable pendant by My Mini Munchies. It perfectly captures the look and mood of knitwear in a tiny, colorful package. It’s also a great example of how one can achieve any color or combination with blending – we can’t do that with seed beads! There are some designs out there that, if you’d never heard of or seen polymer clay designs before, you’d never guess were made with a pasta machine and lots of patience. 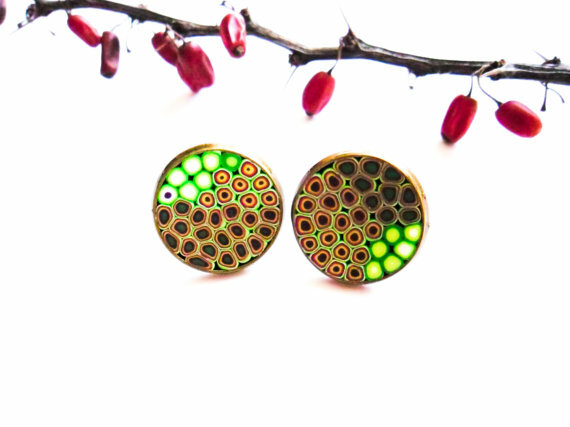 These earrings by Silvia Ortiz de la Torre are a great example of how intricate and alluring this medium can be. 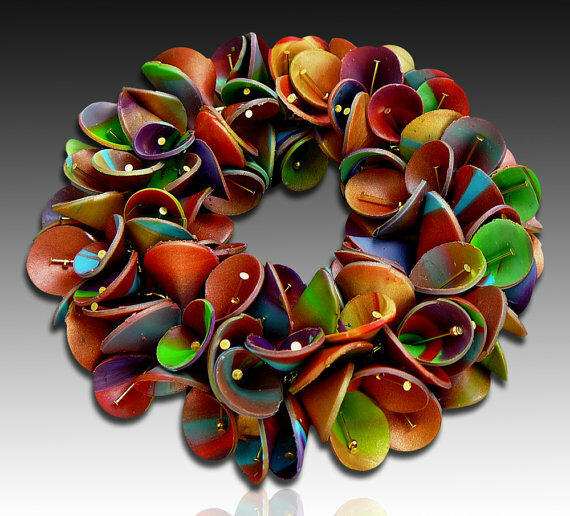 Do you use polymer clay beads in your designs? Have you dabbled with smooshing before? What styles and techniques are your favorites?